Ignite Success enables our customers' salesforce so that they can best support customers' long-term strategic objectives and consistently align business priorities with technology strategies. This learning programs are the result of an analysis to the shift in Enterprise IT budget planning, combined with the increasing influence of business leaders in the IT spend decision making process. Ignite Success' goal is to accelerate Evolution from Product Selling to Consultative Solutions and Services Approach. The methodology used in this programs is composed of 3 phases: discover, act and consolidate During the discover phase, the students will learn to identify sales opportunities, and understand business problems of their customers, as well as translate them into technical solutions. 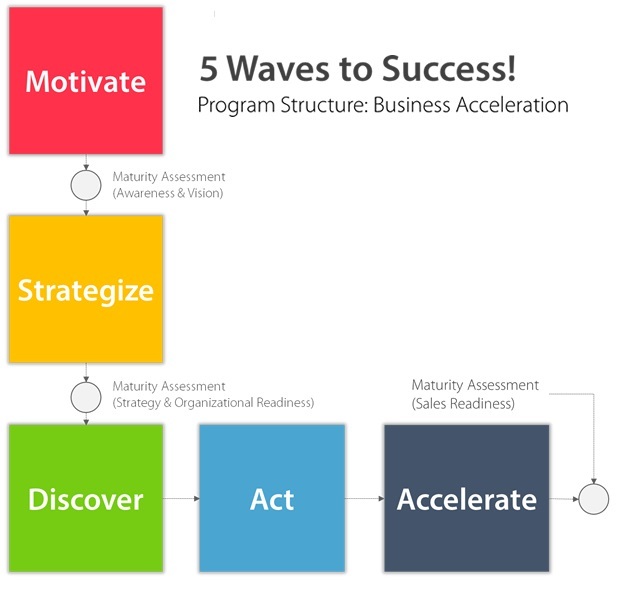 The act phase provides the students with the tools and knowledge they need in order to boost their sales and drive adoption of the solutions sold, and to complete the program, the consolidate phase finalizes the program, completes the knowledge and skill set needed to consolidate the sales practice in the channel partner.